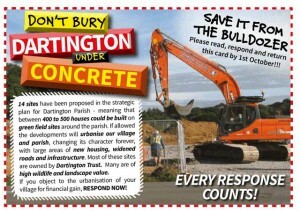 Two months ago Don’t Bury Dartington Under Concrete (DBDUC) and its campaign didn’t exist. 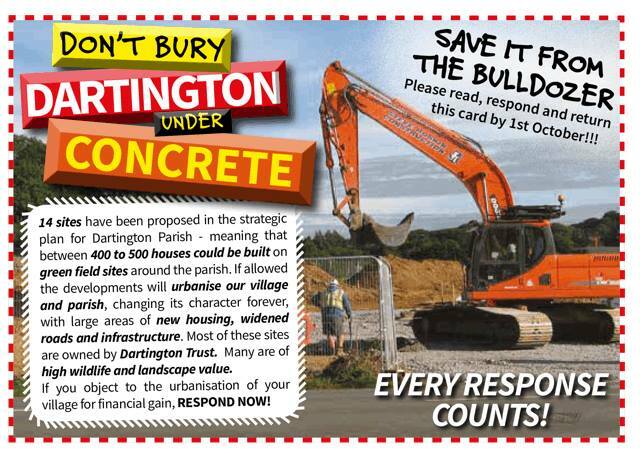 Spurred on by the shocking photo of a bulldozer in the Sawmills Field site on the cover of our parish magazine, several locals turned up at the Parish meeting on 10th September to find out more about Dartington Hall Trust’s (DHT) plans to include 19 sites in South Hams District Council’s (SHDC) Strategic Plan – and shockingly found out that, potentially, almost all could be accepted. If so, the value of these fields would turn from thousands to millions of pounds overnight. Large commercial developers would quickly move in to cash in on building large blocks of housing over the fields, whilst providing a huge cash windfall to the Trust. Government policies new recommend massive increases in housing development and the National Planning Policy Framework has a presumption in favour of development, which is leading to a huge drive across England and Wales by developers. Who is planning our future? DHT employed planning consultants WYG, who pride themselves on offering “all the expertise needed to make challenging concepts possible and then to make them happen”, to identify 19 sites and persuasively remind SHDC to ‘be robust’ in their decisions or maybe face criticisms or penalties from higher up if they wavered. WYG list amongst their achievements building a city in the Saudi Arabian desert, helping expand Britain’s nuclear power capability, and supporting Russian coal companies to extract coal in Siberia as the Arctic ice sheers retreat. The question we raised was what does that say about DHT’s choice of consultant and attitude to our village? Although Dartington Parish Council had been dealing with plans and proposals from DHT over the years, such as those that had led to the widely-disliked Sawmills development – the meeting underlined the urgency of the situation. A quick look at SHDC’s procedure for comments on the proposals and plans revealed why comparatively few locals had objected; it was complex, unfriendly and relied on complex map reading and needed finely-honed jargon-busting skills. 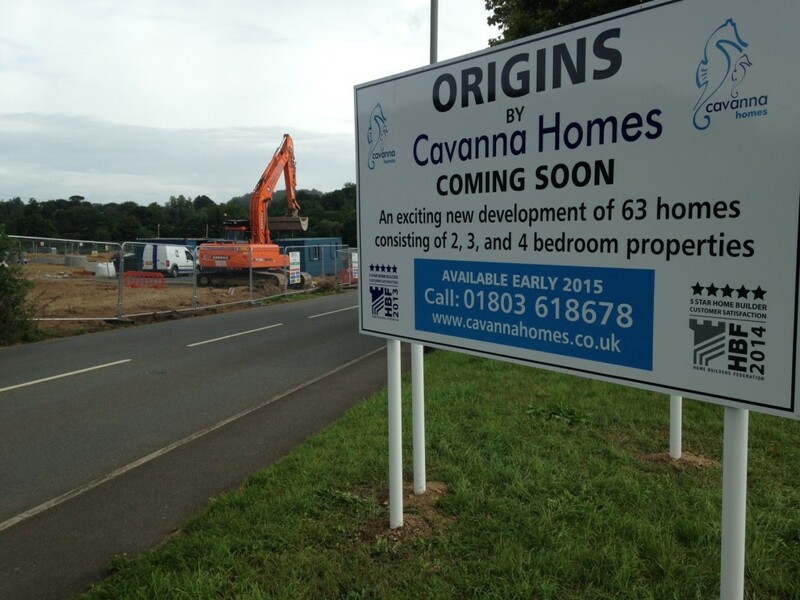 The widely despised ‘Origins’ development at Sawmill Field. Most of the consultation period was over August when people were away, so we had just weeks to make our views known. At the same time almost every conversation at the village shop, school gate or over the garden fence quickly turned to the anger and frustration people felt at a scenario that could destroy our village forever. A few of us decided to make understanding and commenting on the proposals simpler. Our postcard, signed by over 1,000 local residents. Its stark image was a chilling metaphor for the death of our village. 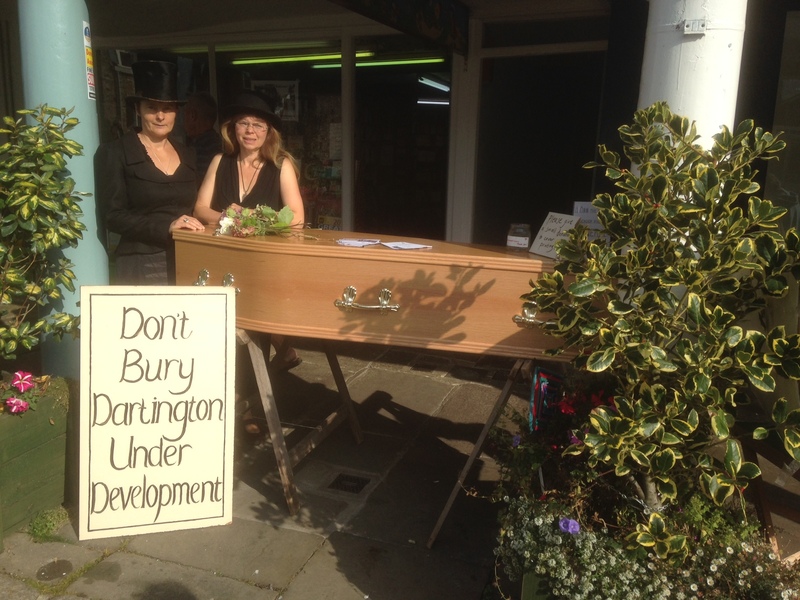 Those who took the coffin and objection cards into Totnes High Street did not wear their mourning black lightly and dealing with the shock, disbelief and anger of so many hundred local people who came to talk to us and sign cards was not easy. Almost everyone understood and agreed with the severity of our campaign. Gathering signatures with our coffin. Totnes High Street. Meanwhile DHT ignored communications from local people and postponed their scheduled Community Conversation on the matter until 1st October – the last day for objections to be received by SHDC planners. 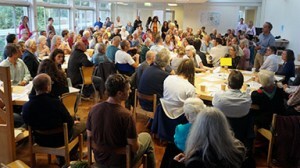 DHT finally witnessed the anger and level of objection from those who would be affected by their plans as over 150 people piled into the Refectory at Higher Close at Dartington for a public meeting. BBC Spotlight and Radio Devon turned up but no recording was allowed in that meeting. Anyone who attended will tell you that it would have made explosive listening! Over 2 hours, local people asked DHT Chief Executive Vaughan Lindsay why would a charity whose stated aims are sustainability and social justice propose such developments purely for cash? Why didn’t they live their values in the parish that they shared? How could they destroy the village and its surrounding countryside? Questions were asked about the validity and morals of a charity selling off land for cash against the wishes of the people it was partly set up to serve. Throughout the evening the big ask was for DHT to withdraw the sites from SHDC’s plans. To date they still refuse to do so. Meanwhile we were engaging with the Dartington Neighbourhood Plan, so that local people can consider the whole parish and its needs for the future, to allow for some sustainable housing developments that could meet the needs of local people without ruining our environment. DHT said that they would be involved in this positive process that was recognised by the planning authority and held some weight. But how, following their refusal to withdraw, could we do any Neighbourhood Planning when our parish was so severely compromised? After over a year of meetings, surveys and maps and hundreds of hours input from local people it could all be overturned by the proposals in the final ‘Our Plan’ document. It became essential that the sites be withdrawn if Neighbourhood Planning was to be meaningful and our parish not jeopardised. Friday 3rd October was the closing date for objections to be sent to SHDC. 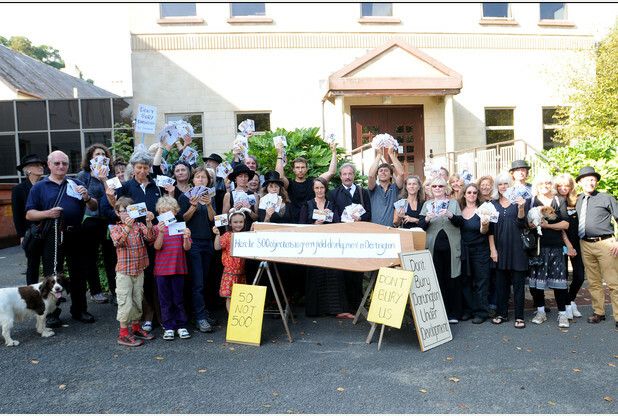 We chose Thursday 2nd October to present over 800 objection cards we had collected on the streets, house to house and at the village shop, to a meeting of Full Council. Appropriately they were delivered by mourners bearing a coffin. 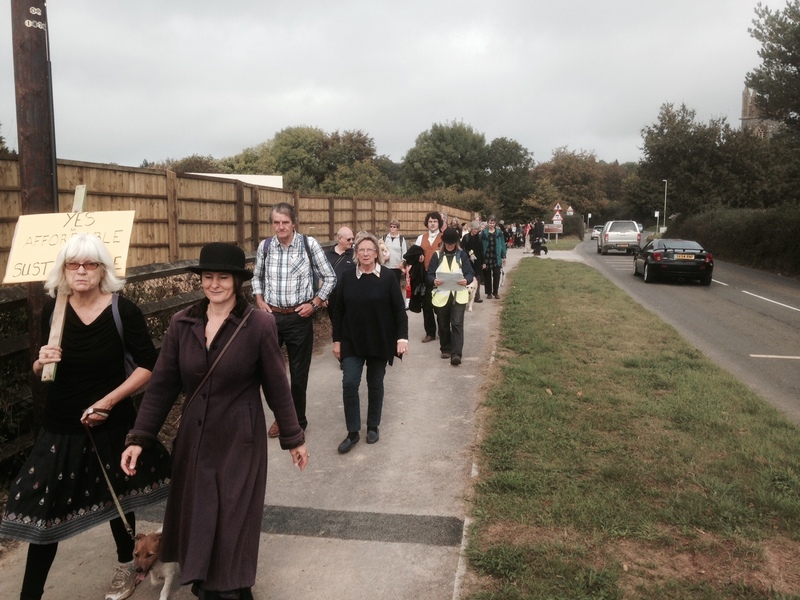 We decided to walk from Foxhole on Dartington Estate to the SHDC offices at Follaton, passing many of the green fields proposed for development along the way. We hoped that it might be a chance to finally meet and talk to the Trust’s nine trustees who are responsible for making the decisions. To date we had no communication with any of them. We invited each formally but received one letter from DHT’s chairman on their behalf. Not one came. Thankfully BBC Spotlight, local radio stations, local and regional press did and it was pressure from the media in addition to all those who gave up their day to walk over 2 miles to present our case that made CEO Vaughan Lindsay meet us and respond. Joining us in the SHDC offices he requested a longer consultation period – but did not withdraw the sites. SHDC granted a mere 4 weeks more – no time for us to progress a whole Neighbourhood Plan. Over the following weeks DHT were still not prepared to withdraw although they used the press to try to say that they were working with us. Delivering our cards to Follaton House. How much did we need to do to get them to change their minds and act responsibly? Their minimal moves to seem on board with the community, their ‘spin’ on every press story, yet quiet persistence with these plans shows the chasm that divides the Trust’s stated values from their actions. One of their most controversial of DHT’s recent proposals was to build over the community green spaces between the houses in Hunters Moon. Designed by Dartington Trust founders the Elmhirsts, the cul de sacs of houses all shared play and community spaces and the space has certainly built a safe and child friendly community. Initial objections by the residents were met by challenges from DHT’s top lawyers, who told residents that they didn’t have a “village green”, as Dartington isn’t actually a village but rather a collection of hamlets. Given another deadlines from SHDC of 31st October, we asked DHT to call an Extraordinary Meeting of their Trustees, where we could put the case for withdrawal of the sites. They met the following weekend behind closed doors. We have asked for minutes but received nothing. For that meeting we asked that DHT start to consider how it can embed its stated values into all that it does in future; a solid antidote to the schizophrenic behaviour by which it makes grand claims to stand by its aims and acts in ways that are totally contrary. This issue has, to date, not been addressed. It seems that DHT is so far from its roots that it fails to understand the schism between its principles and its actions. Communities are not built out of concrete. Only one trustee, Stephen Jones met with a DBDUC representative and planners a few days later and said they had decided not to withdraw. Worryingly, Jones stated that we should let large developers ‘build communities’ around Dartington. We don’t believe that communities can be built out of concrete – quite the reverse. Communities are all about people living alongside each other, caring for each other and their place. Through all this DHT has achieved by accident one of its main stated aims that of ‘building a resilient community’ – the people of Dartington – of all ages, politics and interests have become united and determined to stand up for the future we want – not one imposed on us by DHT. The next day, at the next well attended Neighbourhood Plan meeting property manager Jo Talling announced that DHT would withdraw the sites to allow us all to work on the plan without being compromised by the Our Plan proposals. A caveat that SHDC would have to give a written guarantee that DHT could reintroduce any of the sites ‘without prejudice’ – (why would they wish to put any back that locals expressly objected to?) – gave DHT the ultimate get out clause. We heard from Vaughan Lindsay that days later Jo Talling and Simon Cronk from DHT’s Property office were however having ‘slightly different discussions’. Then, to nobody’s great surprise, SHDC did not agree to a letter of immunity, DHT decided they couldn’t withdraw without it – and together they have colluded to get past the 31st October deadline with the sites still in the plans for consideration. It was a real Halloween horror story. As time goes on, it becomes clear that DHT chooses not to understand or care for the local community or environment. Its Trustees are disengaged – the majority are based in London – and clearly have no intention of making contact with the very people their decisions affect so much. They are playing with our lives and our futures – for a short term cash gain – rather than managing the Trust well and balancing the books. We will not have our village sacrificed to plug their financial mismanagement. Because this charity does not live its values, because it is so distant from the wishes of local people; the Trust’s behaviour in this debacle brings into question its highly commercial attitude to its resource as well as its basic morality. How should a Trust that has a great reputation for its work nationally treat people and the environment on its own doorstep? Through the current management’s actions, they have lost the respect of most in this village and should not be trusted to plan OUR future. A Vote of ‘No Confidence’. For these reasons, we have lost confidence in the current Management and Trustees of DHT to manage the land off their core estate and we shall be holding a Community Vote of No Confidence in November – plus a wider online poll. The vote is the first of its kind in Britain and will send a very powerful message to the Trust and media from the residents of Dartington and beyond. To present the findings, we plan a very public funeral service, with representations of each and every No Confidence vote – as if we could leave DHT in any doubt about the lack of trust we have in them. The funeral theme is as appropriate as when we first campaigned. It speaks of the deep sadness that we all feel as we hold a service; for the loss of local people’s esteem and trust in the organisation and the death of Dartington Trust’s values. We all love Dartington’s history and values, and the sense of sadness at the level of betrayal of recent weeks is palpable. I studied at Dartington College of Arts and worked at Dartington Hall School and Dartington Tech, which roughly covered the period 1967 – 85. My son still lives in the area and there had been a time when I had hoped my children would also be able to work on the Estate. However, I witnessed at first hand how the Trustees became distanced from the local community, preferring a retreat into some quasi-religious pipe dream with no relevance to the problems facing individuals and communities in the late 20th century. When you think of Leonard’s practical streak (Dartington Glass) and willingness to engage with local people his successors have been an unmitigated disaster with Vaughan Lyndsey being a living parody of everything that has gone wrong. My best wishes for all your efforts.